Hungarian Jews welcome pension hike for Holocaust survivors, but say government needs to do more to combat anti-Semitism. The head of one of Hungary's leading Jewish organizations welcomed a pension hike for the country's dwindling number of Holocaust survivors, but said the government needed to do more to combat extremism and anti-Semitism. 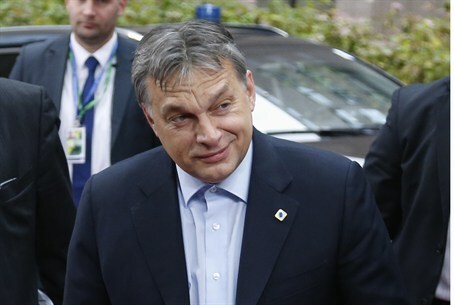 "These are very positive steps," Peter Feldmajer, president of the Federation of Hungarian Jewish Communities, told AFP on Wednesday. "Much more needs to be done, however," he said. "Commemorating the Holocaust needs to be backed up by more condemnation of modern-day far-right extremism." On December 20, Hungary's cabinet announced that from January 1 a special pension set up in 1997-1998 for the country’s estimated 7,000-8,000 Holocaust survivors would increase by 50 percent and by a further 50 percent one year later. Last year the pension amounts ranged from 5,000-30,000 forints (17-100 euros, 23-133 dollars) per month depending on age, Feldmajer said. The Jewish leader also welcomed the government's announcement of a new committee, to coordinate with Jewish civic groups memorial events planned for 2014, marking 70 years since the mass deportation of Hungary's Jews began in 1944, AFP reported. He said, however, that relations between the government and the Jewish community had been soured recently by the inclusion of a number of wartime Hungarian authors with fascist leanings on a new national school reading list, as well as the recent granting of state aid to a prominent Budapest theatre whose director has a far-right background. "These acts have poisoned the atmosphere and are difficult for us to accept," he told the news agency. "The basis of not repeating the Holocaust is education, but such moves make it harder to educate people and children about it, as well as strengthening the far-right." At least 450,000 Hungarian Jews perished during the Holocaust. Around 100,000 people of Jewish origin live in Hungary today, although the number of those actively involved in Jewish community life is estimated at 5,000-10,000. In recent months the government of right-wing Prime Minister Viktor Orban has faced harsh criticism that it is not doing enough to counter anti-Semitism and the rise of far-right groups, like the neo-Nazi Jobbik party. In November, a deputy of the Jobbik party caused international by proposing in parliament drawing up a list of people "of Jewish origin (who) present a national security risk to Hungary." Jewish groups slammed the Hungarian government for failing to respond adequately to the neo-Nazi proclamations. A week later, Orban heeded Jewish calls by saying, "we Hungarians will protect our Jewish compatriots". In May, Nobel laureate and Holocaust survivor Elie Wiesel returned Hungary's highest state honor because of what he called a "whitewashing" of history in the European Union member state.